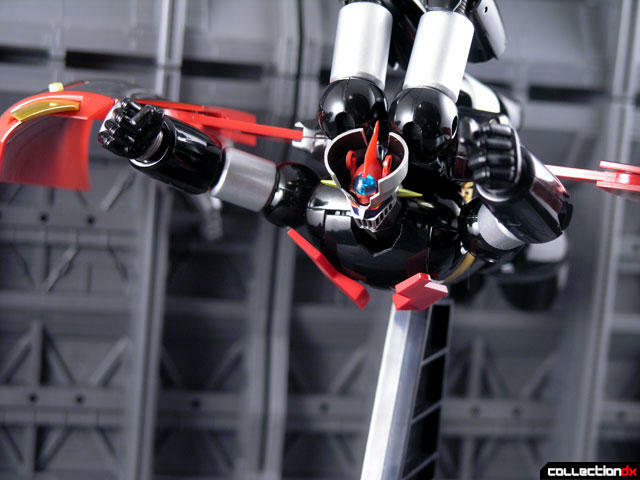 When Mazinga Z was relaunched in 2009 with a new TV series, we knew there would be changes. 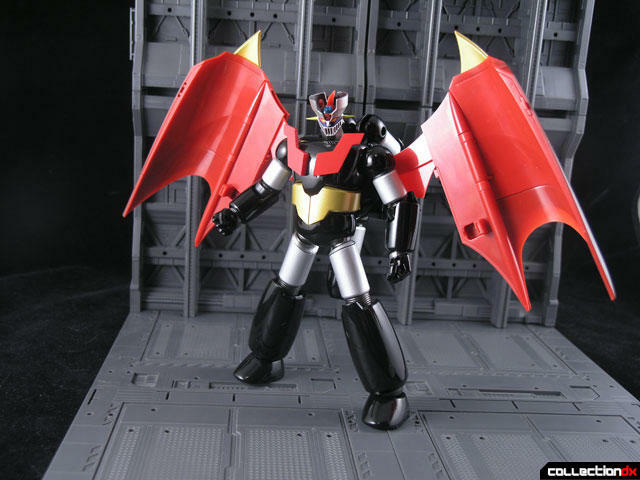 But I don’t think anyone expected a change so radical as to make Mazinger a Transformer. 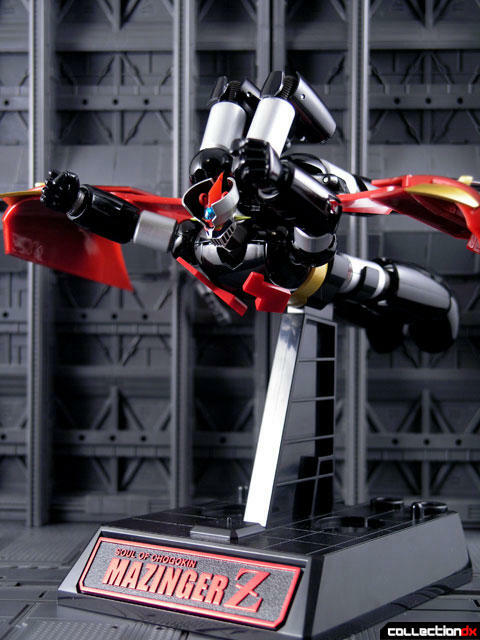 When the GX-45 Mazinga Z Soul of Chogokin was released, it was a pleasant surprise. 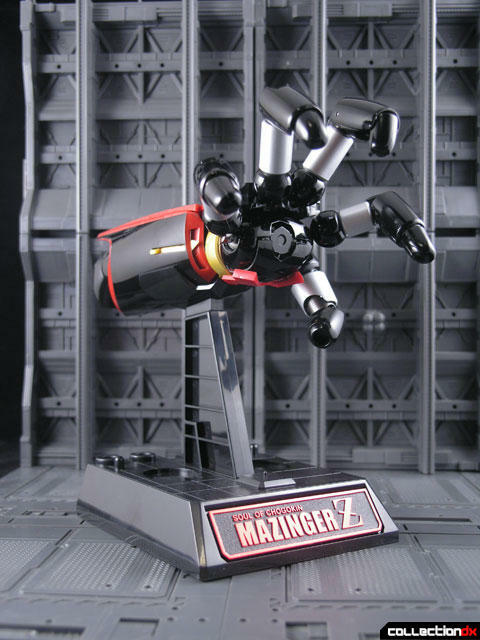 It was a great toy, with new engineering, but the basics of Mazinger stayed intact. 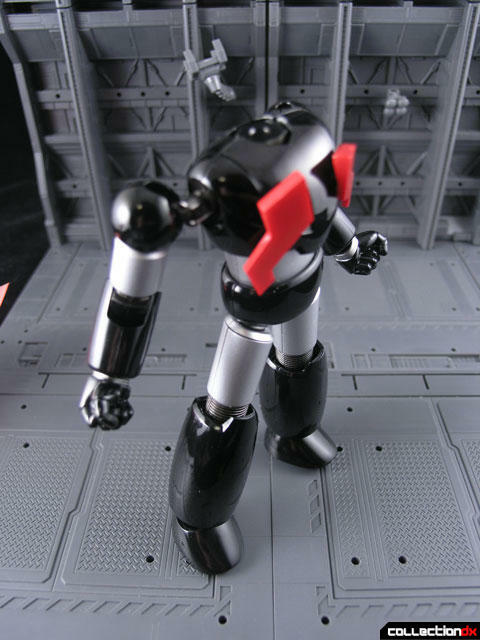 Then shortly thereafter, another Mazinger was announced. It looked like the same figure, but with a large wing called the God Scrander. 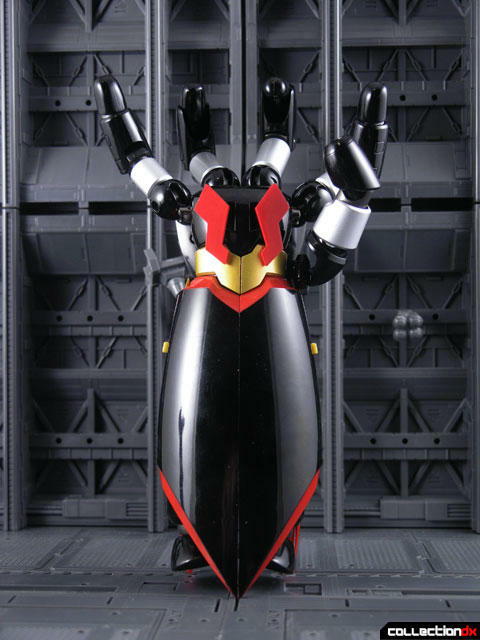 This scrander could wrap Mazinger and turn him into a giant fist. So why the two releases then? Why not just bundle the scrander with the GX-45? One theory is that that maybe including the fist gimmick would have been a “spoiler” for the series”. The most likely scenario is that despite similar appearances, the GX-49 is an entirely different toy. 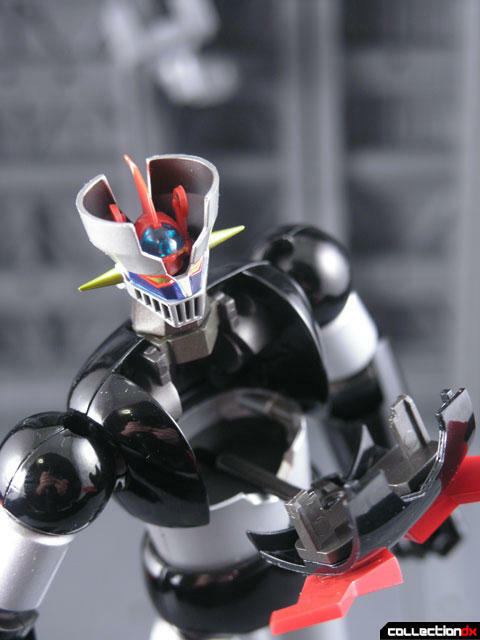 At first glance the core Mazinger Z figure looks the same, but closer inspection reveals a ton of differences. 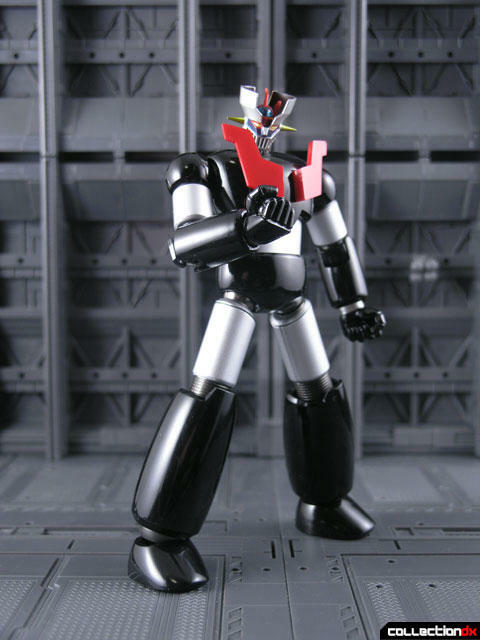 First, this new Mazinger lacks a lot of the articulation that the previous one had. Gone is the chest joint and waist joint. Gone are the lower metal legs and feet. Also gone is the ability to extend the leg and ankle joints. The chest and lower legs are an entirely new mold. The head still looks nice and sharp, and still includes the detachable hover pilder. The hover pilder has a clear canopy and the wings can fold. Be careful – the tail of the pilder extends beyond the back of the head – it can easily be bent or broken. 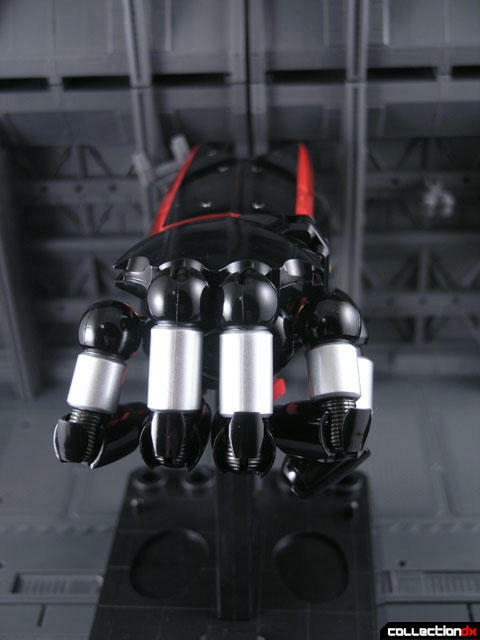 The upper arms are metal, and the lower arms are held in place by magnets. Forearms are swappable between regular and firing arms. Two sets of hands are included – open and closed fists. The God Scrander is a really massive wing for this figure. 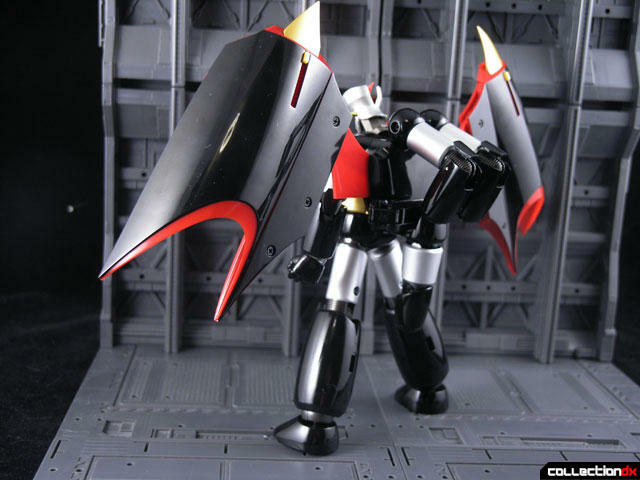 It features segmented sections so you can pose the wings in a variety of ways. The wing fits into a slot on the back and then snaps around the waist in the front. Three awkward jets protrude from the back of the scrander. Combined, the toy is very top heavy. The God Scrander and Mazinger Z can transform into what is known as the Big Bang Punch. This attack is literally the Fist of Zeus, and this glowing attack is extremely powerful. The transformation is almost a “perfect” transformation, meaning almost no parts need to be swapped. 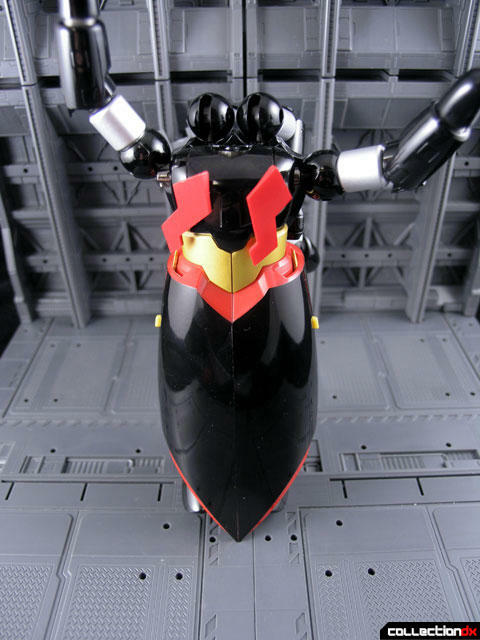 To start, the chest of Mazinger opens and the head is folded down into it. The chest ornaments are folded down. The arms get pulled out and shoulders bent back with a new joint system. The hands are removed and replaced with fingertips (the only parts swapping). Push the gold points down on the wings of the Scrander, then push the wings down and back until they click together. 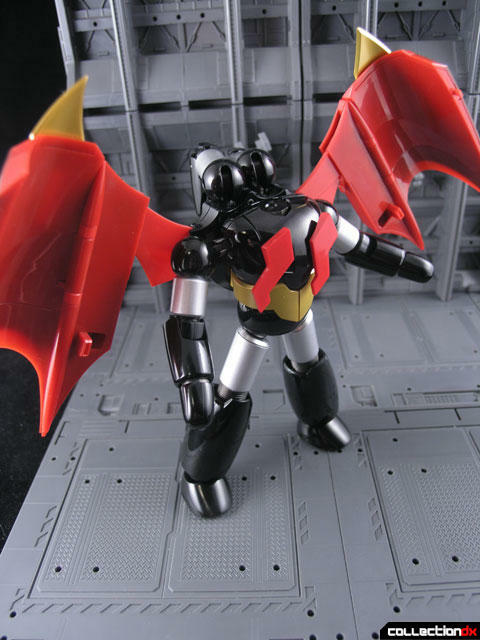 Unfold the red tabs in the wings and attach to the back of the legs, then bring the wing sections around the front and click together. 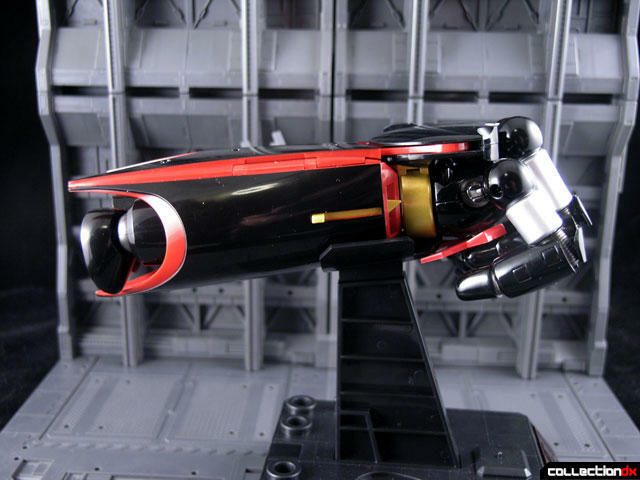 The jets on the back of the scrander are then swung around and become fingers. The fingertips unfold from the end of the jets. There you have it – the Big Bang Punch! It’s a little small compared to my hand, but probably the same as an average Japanese persons hand. 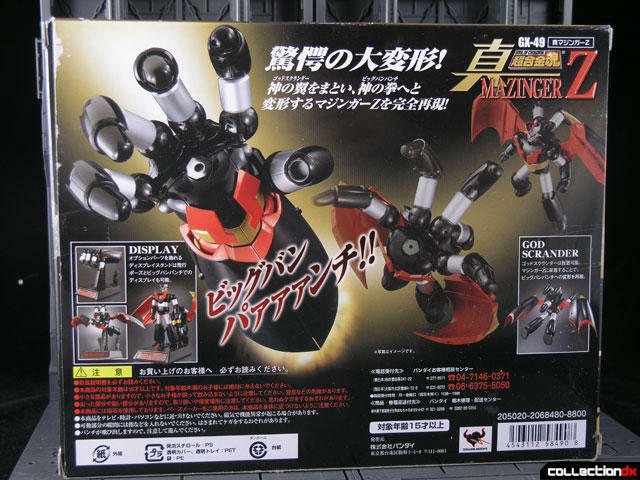 While the attack is supposed to be in a fist, it is a fully articulated hand, so you can put it in a variety of poses. Several stand parts are included so that you can display the toy in either robot mode or Big Bang Punch mode. The stand attachment for the punch mode is weak – it doesn’t clip on at all, so if you move it wrong it just slides off. 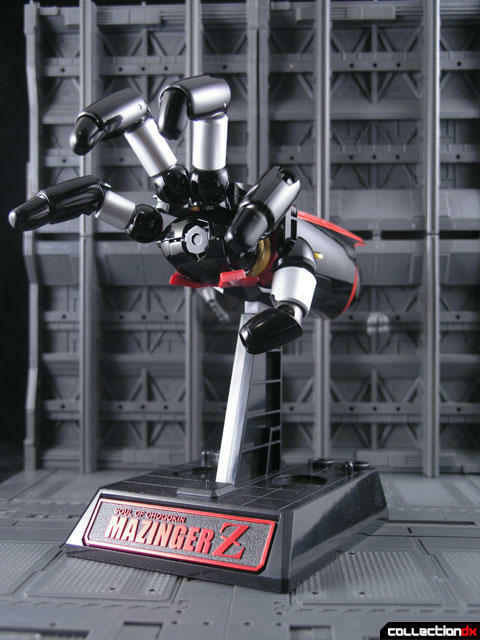 In robot mode the stand has an attachment for Mazinger in flying mode, or standing with a place to rest the scrander. I was surprised as to how different this was than the GX-45. It’s an entirely different toy, with a unique transformation. 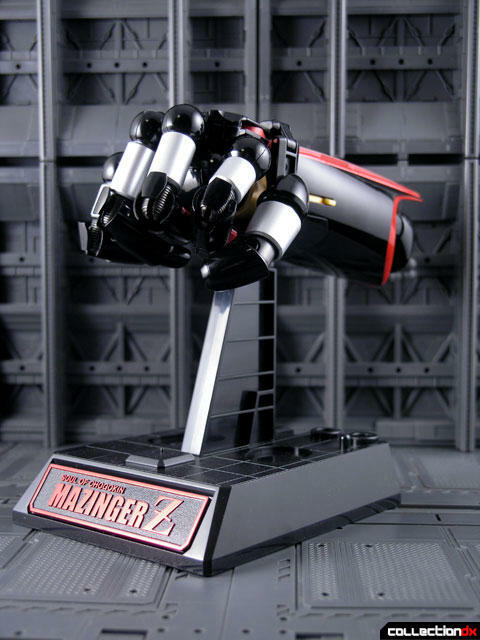 Purists will scoff at the idea of Mazinger Z Transforming into a fist, but fans of the new anime will appreciate the gimmick. In my opinion, it’s not a bad toy at all – it’s just not essential. It’s a one-trick pony. What it does, it does well, but you really have to like the alternate mode to justify buying it. Oh yes, I have this one. 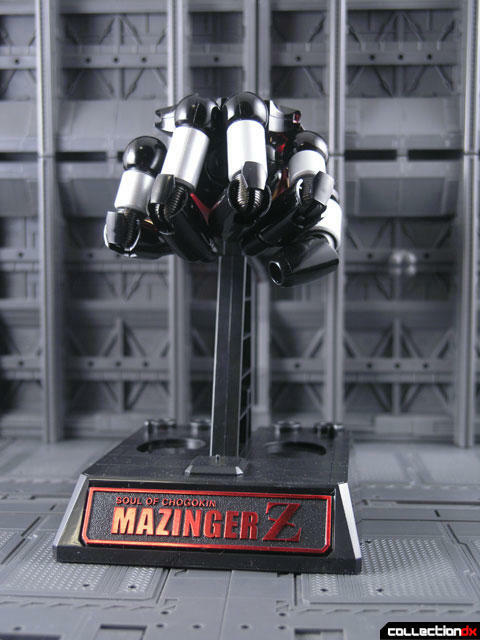 From the very beginning, it was the only figure of the then upcoming nu wave of Mazingers I planned to get. Just for the transformation, it felt just right to have a transforming Z. But, when it came out I was just pondering the dirty tricks Bandai has been pulling lately on customers. I think Josh is very generous to ascribe the belated announcement to a concern for disrupting the series' suspence, it seems more realistic to me that they just tried to catch two birds with one rock. First they release a superposable Maz celebrating the new series, then they announce they will be issuing the same toy with a gimmick(and don't even get me started on Big O's accessories set). And to top it off, what's the big idea behind the latest release? How do we make it different from the previous? Let's make it worse. Let's make the legs plastic. The previous had them in metal. Great idea. This way we'll make it almost impossible to pose it with the scrander on (but ehi, that's what we give them the stand for, right? Let the scrander rest there). Maybe I'm oversarcastic here, but they simply did a string of totally unnecessary changes for the worse. The ankle articulation, for example, there was no need to do anything to that, being able to pull the legs would have helped greatly for major stability with the scrander on. I would like to try the scrander on a gx-45 to see where we can go. Of course, there are a few glitches that are exclusive to this release (or to my specimen, any way)like the chest that just does not stay closed, or the breast fire that comes off at the slightest tremble. And of all the things they did not change, they left the same pilder, with a fin way too long to fit in the chest without bending dangerously. All in all it is not a terrible toy, but a blatantly missed chance to deliver a cool one. I would have expected this from any other company, but not Bandai. In the end, I got it as a gift for xmas, and I'm glad I did not spend my own bucks on it. Agreed this toy could have been so much more if they'd just left the legs alone. I decided to get the GX-45 as well it's a much better figure. Also you're not alone in worrying about breaking the pilder during the transformation, I usually just leave it out. I think a number of articulation points and diecast areas were removed not because it was structurally infeasible, but just as a means to keep the cost down. 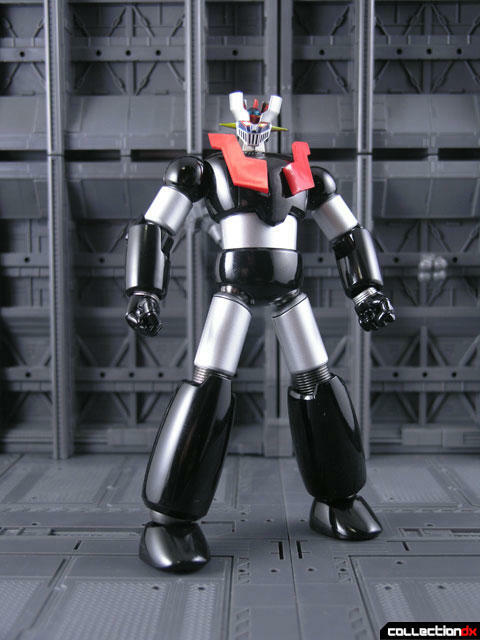 At around a hundred bucks it was already expensive for a Mazinger, and most fans had already picked up the GX-45 by the time the God Scrander version was announced. 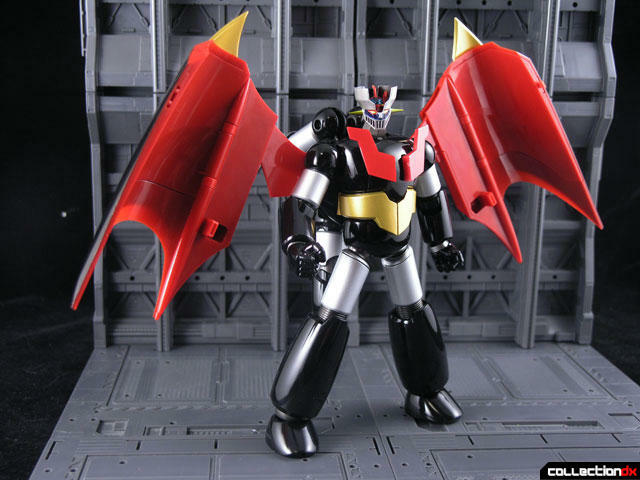 Bandai was probably worried not enough folks would bite the bullet if a "fully decked out" God Scrander Mazinger was released if it meant adding another $25 or $50 onto the price tag. 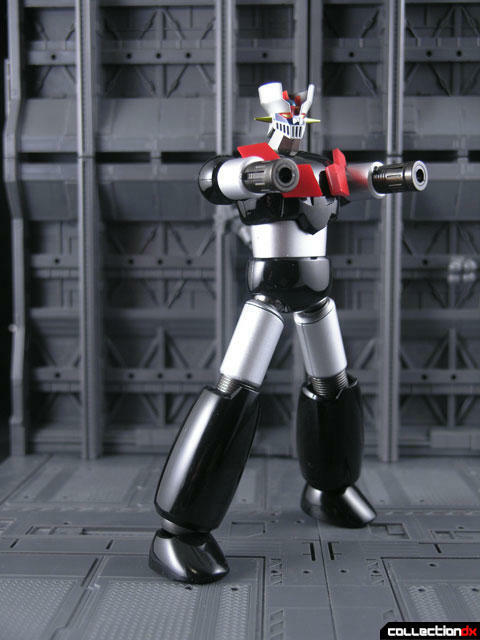 When I had placed my pre-order, I never would have guessed Bandai would sub out the feet and legs with plastic instead of metal. It stung me hard when I opened him up. Other than that (which is pretty huge! ), I do like the toy and its design. And yes I liked all the new Shin anime. Except how easily Garada and Doublous go down! No Way. The Big Bang Punch is awesome in the show,but how many people are going to actually display the toy in hand mode? Well from personal experience I can tell you that Bandai products tend to have good availability even years after release. 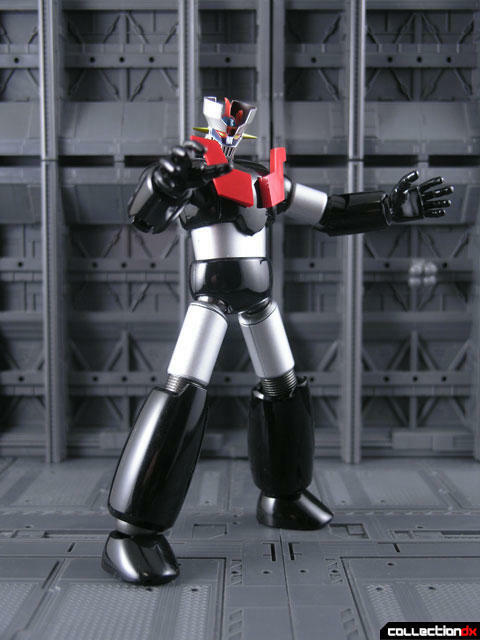 However with Mazinger I think the smaller amount of diecast was known well before the figure hit the shelves. It's a pain, but you really do have to crawl through all of the hobby message boards to get all the necessary information on a product to make an informed decision. Waiting for picture reviews can help. Video reviews are even better in my opinion. There's a lot of little flaws that are easier to catch when someone's actually playing with the damn thing that aren't always apparent in static photos, whether it's loose joints or pieces falling off or a troublesome transformation. The hobby has a lot of shining gems but also a lot of turds. Sometimes it's not easy to tell what will be hot and won't be. I've been let down by figures more than a few times, but I've also been pleasantly surprised with other purchases as well. apex3, I'm with you, man. apex3, I'm with you, man. Getting burned on lackluster modern gokin is partly what made me reconsider vintage toys years ago. There were always some annoying little problems seemingly with every modern toy...and it was usually because of poor design choices that were really just inevitable given the complexity of these things. Vintage toys, on the other hand, are usually well-documented, much simpler (so fewer things can go wrong), and possess a really neat aesthetic. I suggest this: if you get burned two out of three times with modern gokin, you still need to wait for reviews. Even if you end up having to pay 3 times more well after the release of the toy, you're only buying 1/3 the number of toys (since you're obviously not going to get the duds revealed in the reviews). You break even...but at least you don't have to deal with getting burned and potentially having to resell an opened modern toy. And, really, think about the numbers here: you're not really paying 3 times more after the release of the toy...it's probably only 50% more, tops. And at the same time, depending on your personal preference, a good half of new toys are duds. So if you wait, you have to be patient and you sacrifice "being the first" to get the toy, but you come out ahead in the end. Yeah, patience is a tough one. Not to keep advocating for vintage (if you're not into it, you're just not into it), but many of these toys came out before we were born! So, there's no "right away"! All you have to wait for is the right specimen to come along on the auction circuit, and obviously for your bank account to be able to handle it. Once you get into that mindset (where the search is what's paramount), patience around new toys becomes trivial because even well after they come out, they're generally FAR easier to find. Not being in the field of toy production, I'm not that sure that making brand new molds for legs and lower torso is the best way to maintain low prices. 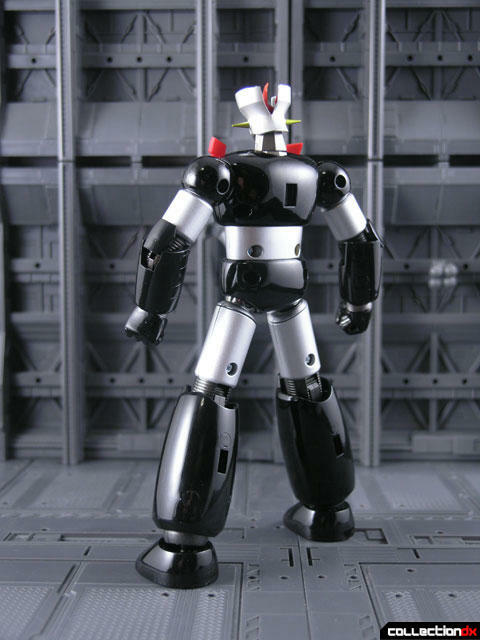 Problem is, if they simply put out a gx-45 with collapsable head and god scrander no one would be here complaining. 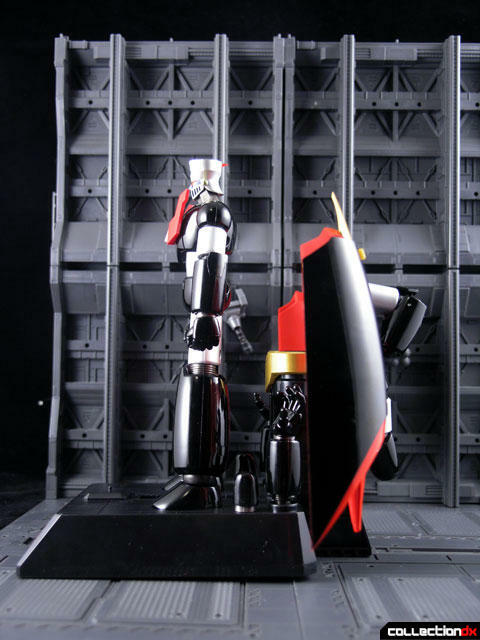 There is simply no reason to limit the posability of gx-49 in the legs. Maybe the torso would have been a harder item, but I think that if they tried spinning those little synapses of theirs a lil' bit faster, they would have come up with a satisfactory compromise. Speaking of Bandai turds... Yesterday I saw a preorder for the Nanbara base for gx-50. Someway, this does not seem the same company as before, any of you has any idea on the matter? Yeah- new molds=lower list price? huh? Does not compute. 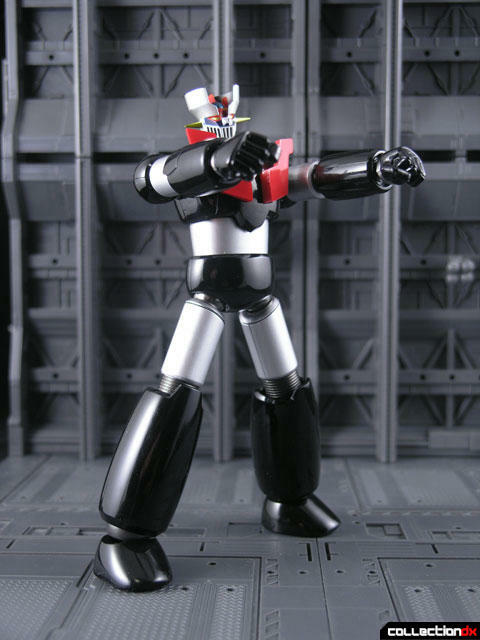 Read the article here about the slumping sales in the U.S. market for Bandai. When they pull crap like this, it is more than the current economic conditions that negatively affect their sales! 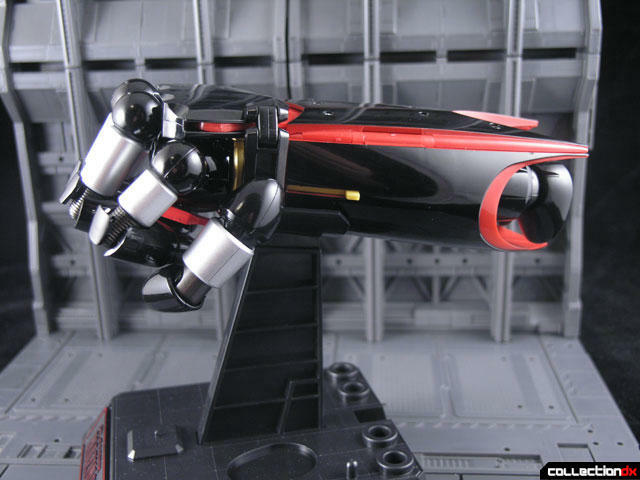 I am very wary of Bandai after the GX-49 experience. And yes, the Nanbara Base looks really cool- but I would never pay even close to that for it. Even with the coupon (Japan only?) they offer for the Nanbara Base, Bandai is out of their collective minds with this pricing! 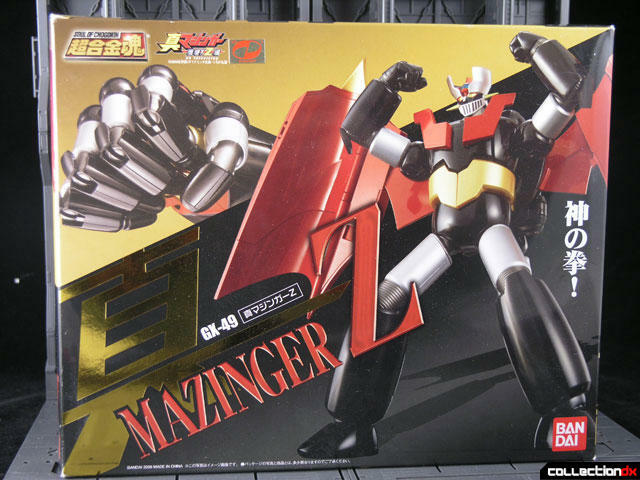 I still just want the Mazinger Z that turns into a car. Been looking for that particular Mexican bootleg for years, if for no other reason than to just show it to people. 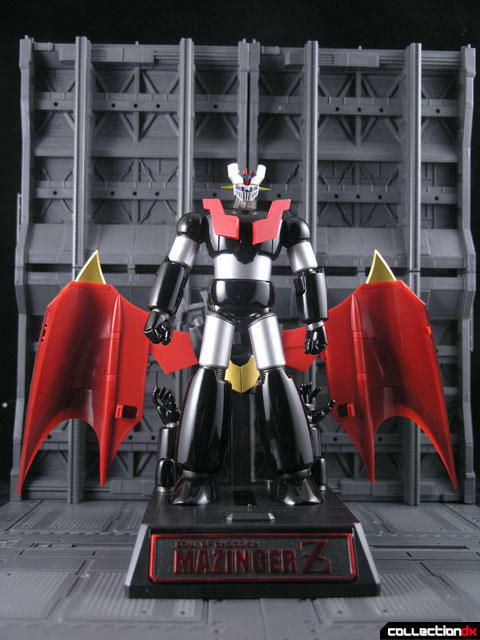 "The previously-released Soul of Chogokin GX-45 Mazinger Z now comes packed with a brand new weapon of mass destruction--the ultimate God Scrander!" -_-' Always wait for the reviews. I said this before in the GX-45 review... I hate this Bandai Rip-OFF !! !